The X of X Humans created but do not quite understand their own decision-making nor the systems that were created by their decisions. It is the business of decision-making to handle this complexity and uncertainty of the companies, universities, and governments so created. To do so, we humans must understand ourselves, which requires self-reflection. What is it that we are doing and why? On p. 113 Churchman writes that “the successful outcome of the problem of self-reflection is to find a minimum loop that leads from x to x.” On the pages before that he has shown how that ideal runs into difficulties. 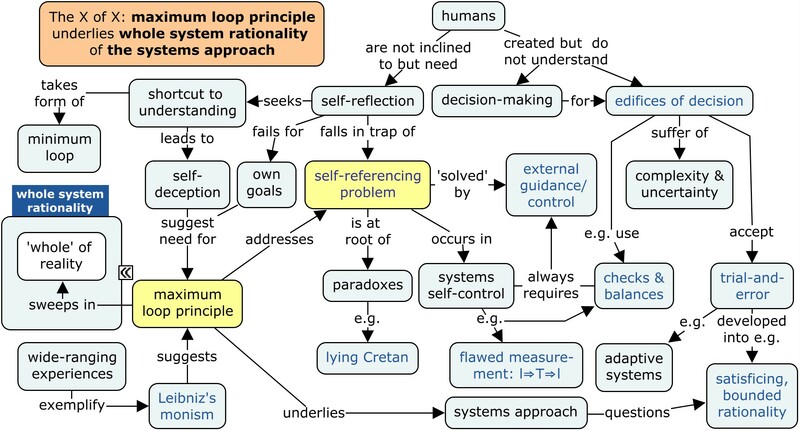 Self-referencing and self deception The minimum loop principle seeks to follow the shortest possible route to maximum understanding. One of the options is to use logic, but this can be shown to get us into the self-referencing problem. Not only does logic not lead to interesting insights because of its often tautological nature, but it also ends up in intractable paradoxes such as that of the ´lying Cretan´ of Epimenides (around 600 BC). A similar phenomenon occurs when we seek to create self-controlling systems. Churchman gives a few examples, including the problem of measurement (something he learned from his philosophical ‘master’ A. Singer Jnr.) and the concept of checks and balances in USA government. No matter how hard we try, there will always be a need for external guidance or control. Trial-and-error Because good, effective solutions are hard to come by there is a lot of trial-and-error in handling complexity. So-called learning organizations attempt to learn from their mistakes. Approaches involving satisficing and bounded rationality can be used to suit particular levels of aspiration (Simon, 1955). Generally, people are happy when “it works”. How do we know it works? Because there are “no complaints.” Why are there no complaints? That’s a question we generally consider too difficult to answer. Sweeping in We can conclude that what the MLP does is ‘sweeping in’ the ‘whole’ of reality. The ‘whole’ is a bit much, so in practice it is restricted to be the whole in as far as it is ‘relevant’ to the system under consideration. This restricting is not an easy matter and should be subject to what is known as a ´boundary critique´ (this is my addition, not Churchman’s). If well executed it can be said to exemplify what Churchman calls ‘whole system rationality’. The systems approach In ‘the x of x’ Churchman does not speak of the systems approach, but he calls it a (‘naïve’) “system-science approach” (1962), instead. It is important to note that ‘system’ here means human activity system, which differs from, say, a physical instance of transportation such as a railroad system. In ‘the x of x’ Churchman indicates that he was already a ‘systems approacher’ while working as an operations researcher in the 1950s, consulting with managers in health, law, education, defense, production and transport. This means that the systems approach was applied 10 to 15 years before it became known as such from 1968 onward. How to learn the systems approach Over the years, Churchman has been describing the systems approach in all its theoretical detail, but he never produced a methodology. Instead, he insisted on the application from first principles, which he all described. Werner Ulrich, with Ian Mitroff one of the most widely known PhD students of Churchman, is one of those who gave the approach more operational bite with his critical heuristics. He introduced the concept at various universities in the United Kingdom, where it is now used frequenty in combination with other systems methods. It came to the notice of the main author of “Wicked Solutions“, Bob Williams. 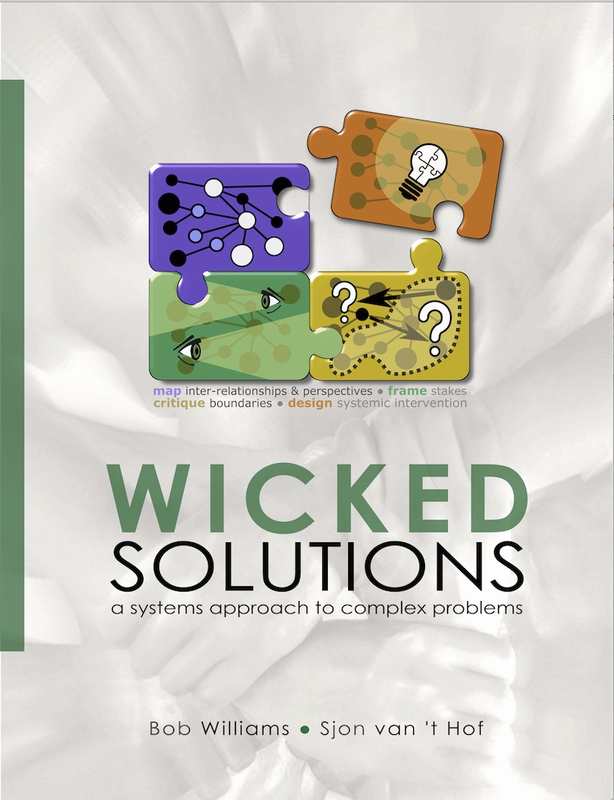 Wicked Solutions was written as a practical and easy introduction to the systems approach or critical heuristics. It is available from Amazon and as a PDF.